Featured Forage: As different wild foods come into season, this feature will highlight the best ones. This is an introduced weed that is very common along roads and trails around Portland. Its four-petaled flowers and slender fruits (siliques) mark it as a member of the mustard family, but the plant smells like garlic, hence the common name "Garlic Mustard". Used as both a potherb and a salad green in its native Europe, A. officinalis is a good source of vitamins A and C. The plant is biennial, generally flowering in its second year. The heart-shaped basal leaves of first-year plants are probably the best part, although stem leaves from older plants can also be used. The boiled greens have a strong mustard flavor, almost too strong and best softened by serving with butter. Raw, the leaves are a trail nibble with zip. The siliques and flowers also have a distinctive flavor that is closer to the garlic smell. White flowers with four petals. Four of the six stamens are long, the other two are short. Fruit (silique) is long and slender; linear or slightly curved. Biennial, producing basal leaves the first year and flowering stem the second. Basal and lower stem leaves are broadly heart-shaped; upper stem leaves are increasingly slender and deltoid. Russula xerampelina is also known as the "Shrimp Russula" because of the aroma it produces when cooked. More sensitive noses may be able to discern this odor in fresh mushrooms, but I have never been able to. In any case, some of this aroma is reflected in the taste, which also is a bit nutty and sometimes rather sweet. The texture is most unmushroomlike, and very substantial. R. xerampelina looks a lot like a bunch of other purple- to reddish-capped Russulas that may be found in our woods. The key characteristics are listed below, accompanying the illustration. The stipe stains yellowish to brownish when bruised, and usually has a rosy flush at the bottom. Young buttons may lack the rosiness, but it is usually pronounced in age. R. rosacea is similar, with a pinkish cap, no shrimp odor, and a very acrid taste (when fresh) that will burn your tongue. It should not be eaten, but go ahead and taste a bit of the fresh cap and gills. It is quite an experience. Other large, purple Russulas have fragile flesh and do not smell like shrimp when cooked. R. xerampelina's flavor makes it great for use with fish, in soups, and in place of shrimp in shrimp fajitas. I know one person who likes it on pizza! This excellent mushroom is common in fairly disturbed woodland areas, and I have a couple of "secret" patches on campus that keep my supply up throughout the fall. One of these is just a few feet away from a regularly fruiting patch of Agaricus augustus! The red huckleberry (also known as "red bilberry") was one of the first edible fruits I learned. The fruits vary in size, and can be as small as BB's and as large as commercial blueberries. The taste varies as well, but will always be quite tangy. Red huckleberries grow in all types of coniferous forests, and are present at most elevations in the Pacific Northwest. In mature forests, they will grow out of stumps and nurse logs. They thrive equally well in young forests and clearcuts, and seem to prefer a lot of light. Some bushes in an area will usually be loaded with fruit, and if you are collecting for breakfast or future snacking you can spend a lot of time on one bush. My favorite recipe for red huckleberries is to pick a handful and pop them in my mouth as soon as possible! The Prince is the most delicious mushroom I have ever tasted. It is closely related to the cultivated mushroom (Agaricus bisporus), but tastes completely different. The hallmark of both the odor and the taste is a very sweet almondy component. Whether raw, dried, or sauteed, the result is mouth-watering. In Portland, the Prince is fairly rare, but I know of one patch that has produced two fruitings of mushrooms every year for the past four years. Other patches don't seem to be so dependable. It's usually a struggle to find the mushrooms before the maggots do, but discovering a nice, clean button of Agaricus augustus always makes my day! One of the best fish for the table is the Eastern Brook Trout, with very tasty white to yellow meat that usually lacks the astringent, fishy character of other trout. Brookies were introduced to Oregon, and have taken readily to many lakes and streams in the Cascades. In some places, brookies are considered a nuisance because they compete with populations of native trout. In others, brookies are a welcome addition, bringing fishing opportunity to previously barren areas. �Small mountain streams, particularly in Southern Oregon, can be teeming with brook trout. The fish eat both terrestrial and aquatic insects, and tend to hole up in beaver ponds, deflector pools behind logs, plunge pools below small waterfalls, and under cutbanks. The largest fish are usually in cutbank areas, and must be approached carefully and quietly. Nothing beats the good old earthworm for catching stream brookies. I sometimes thread worms onto 1/64 oz. jigheads for a little more control, and bounce them along the stream bottom. Flies, especially black ants and caddis larva imitations, will also catch fish. Stream brookies tend to be small, but numerous and scrappy. Check the regulations: Some areas let you take brook trout in excess of the normal bag limit. �Many Cascade lakes have been stocked with brook trout, usually as fingerlings that grow up into wily, impressive fish. Lakes with inlet streams usually have some natural reproduction as well. 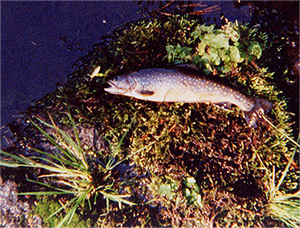 Brookies in lakes tend to bite well in Spring or under cloudy skies. Other times, they can be very difficult to catch. Worms and flies can work in lakes, but I've caught my biggest fish on green Rooster Tails (1/8 oz). Brookies do best in cold, pure water. In streams where grazing or logging has taken place, water temperatures soar and turbidity increases. The result is poor fishing for small and scarce trout. Streams flowing through cool meadows and woods, with clear water and lots of pools, offer better prospects. The oyster mushroom (Pleurotus ostreatus and relatives) is one of the easiest mushrooms to recognize. The clusters of relatively large, fleshy, light-colored fungi appear on hardwood logs and stumps during both fall and spring rains. The fruiting bodies should be harvested as early as possible, since maggots and slugs love to eat them! Small, young caps are delicious when sauteed in a small amount of butter or margarine. If the caps are dry, use more butter; if they are wet, use less. To me, they taste like a richer version of the normal cultivated mushroom (Agaricus bisporus). Small, young mushrooms are also good raw. A variety of species in the genus Claytonia produce succulent, edible leaves. Around Portland, C. sibirica and C. perfoliata are most common. Both of these species have been placed in the genus Montia as well as Claytonia, but the latter seems to be the officially correct classification as of this writing. These species produce a whorl of basal leaves on long petioles (stalks). The basal leaves are usually lanceolate or deltoid (see drawing below). The inflorescences arise on stems. In C. sibirica the stem leaves are opposite and separate from each other. In C. perfoliata, the stem leaves are joined (connate) around the stem so that each pair of leaves looks like one leaf with the stem sticking up through the middle. The flowers of both species are white to pink with notched petals. Those of C. perfoliata are small, in a crowded inflorescence that may appear to be sessile on top of the uppermost stem leaf. C. sibirica has larger flowers in a loose inflorescence. C. sibirica is sometimes called "candy flower". The flowers of both species have five petals and two sepals, characteristic of the family Portulacaceae. The stem leaves of both species are edible and a good trail nibble, but the young basal leaves are the best part of the plant. The plants are easiest to identify when in bloom, but by this time the basal leaves are usually old and tough. Once you have seen them in flower, you should be able to identify the young plants to genus. These species prefer moist, semi-disturbed areas along trails and stream banks. They often grow in large groups, facilitating harvest. One should pick only a few leaves from each plant, leaving the rest to go about photosynthesis and provide food for the slugs and bugs. Beckstrom-Sternberg, Stephen M., and James A. Duke. The Foodplant Database. (ACEDB version 4.0 - data version July 1994). Query="claytonia". Hitchcock, C.L. and A. Cronquist. Flora of the Pacific Northwest. University of Washington Press, Seattle: 1973. Pojar, J. and A. MacKinnon, eds. Plants of the Pacific Northwest Coast. Lone Pine Publishing, Redmond, Washington: 1994.